Introduction: For decades, we have cov­ered the OUN/B, a Ukrain­ian fas­cist orga­ni­za­tion allied with the Ger­man gen­eral staff in World War II. Hav­ing staffed the 14th Waf­fen SS (Gali­cian) Divi­sion and the Ein­satz­grup­pen (mobile exe­cu­tion squads) in the Ukraine, the OUN/B was a piv­otal ele­ment in the post­war Gehlen spy out­fit in its CIA and BND incar­na­tions, the Anti-Bolshevik Bloc of Nations and the GOP eth­nic out­reach organization. With the Yuschenko regime in power, OUN/B founder Stephan Ban­dera was named a hero of the Ukraine. As we see below, Roman Shukhevych was also granted that honor. Shukhevych lead the OUN/B-staffed Ein­satz­gruppe “Nightin­gale” in its liq­ui­da­tion of the Lvov Ghetto! (Lvov has also been known as Lem­berg at var­i­ous times in its recent history.) Shukhevych’s son Yuriy is prominent in the OUN/B associated opposition as well. In Lvov (Lviv), a street has been renamed for the Einsatzgruppe “Nachtigall” (“Nightingale”)! The presence of the younger Shukhevych in the opposition and the renaming of a street after the Einsatzgruppe Nactigall is emblematic of the central role of the OUN/B ideological descendants in the political coalition that has come to power in the Ukraine. Centered on the Swoboda party, as well as the Pravy Sektor, the military and judicial processes in the Ukraine are firmly under the control of the OUN/B heirs. Note that some European politicians are aware of the nature of the OUN/B heritage of opposition forces in the Ukraine. It appears that Swoboda and OUN/B-inspired Pravy Sektor are only two of some 23 extremist groups in the Ukraine, effectively controlling roughly 44% of the population. The Swoboda party has networked with the Hungarian Jobbik party, the heir to the Arrow-Cross fascists allied with Germany during World War II. Like the OUN/B, Arrow-Cross was well represented both in the GOP’s ethnic outreach program and the Free Congress Foundation. It is important not to overlook the the fact that Yanukovich was fundamentally corrupt and incompetent–a quality he shares with the vast bulk of the leaders of the former Soviet Republics and much of the rest of the world’s politicl elite. Writer Palosh Ghosh notes that Swoboda–the largest of these groups–has gen­er­ated con­sid­er­able grav­i­tas from young, edu­cated Ukraini­ans who are dis­gusted with the mori­bund econ­omy. His­tor­i­cally, eco­nomic depri­va­tion has lent pop­u­lar sup­port to the ranks of fas­cist organizations. The new government in the Ukraine has major participation by Swoboda and Pravy Sektor, the heirs to the political legacy of OUN/B, including effective control of the military and judicial process. Of paramount importance is the association agreement that was at the heart of the dispute that ultimately brought the Yanukovich regime down. This agreement–again, at the heart of the Ukrainian crisis–concerned bringing the Ukraine into the EU orbit. In addition to the extreme austerity that would have been imposed on the Ukraine, this agreement is significant because the United States has NO dog in this fight! The covert operation that is evident with the $5 billion effort alluded to by Deputy Secrectary of State Nuland and the diplomatic offensive that has been undertaken in the wake of the Russian move into the Crimea have been executed on behalf of Germany and the EU. We will analyze this more in succeeding programs on the subject. Program Highlights Include: The potential agreement with the EU would have been economically destructive for both the Ukraine and Russia, as well as putting NATO military forces at Russia’s border; the role of Citizen Greenwald’s financial angel Pierre Omidyar in financing the Ukrainian opposition; the influx of Swedish and other European neo-Nazis into the Ukraine to fight alongside of Swoboda and Pravy Sektor; the fact that some 350 jihadists fighting for the Muslim Brotherhood-affiliated elements in Syria joined the street fighting on behalf of the Swoboda/Pravy Sektor combatants; the chants used by the opposition are those used by the OUN/B prior to, and during, World War II; John McCain’s networking with Swoboda. 1. For some time, the pro-EU/German bloc of Ukrain­ian polit­i­cal par­ties cur­rently gar­ner­ing head­lines with protests in Kiev and other cities has man­i­fested the fas­cist roots and alliances of the OUN/B. Both Yulia Timoshenko’s “Father­land” party and the UDAR party net­work with the Svo­boda party of Oleg Tyag­ni­bok (“Oleh Tiah­ny­bok”), which has evolved directly from the fas­cist OUN/B of Stephan Bandera. Now, this polit­i­cal milieu is coa­lesc­ing in the Ukrain­ian pro-EU cadre, push­ing to incor­po­rate the Ukraine into the German-dominated EU. Note that, in addition to individuals associated with Swoboda, former heavyweight boxer Vitali Klitschko has resided in Germany for long periods of time. The Ger­man gov­ern­ment is encour­ag­ing the protest demon­stra­tions being staged in the Ukraine by the “pro-European” alliance of con­ser­v­a­tive and ultra-rightwing par­ties. The “pro-Europe ral­lies” in Kiev and other cities of the coun­try are trans­mit­ting “a very clear mes­sage”, accord­ing to a gov­ern­ment spokesper­son in Berlin: “Hope­fully” the Ukrain­ian pres­i­dent “will heed this mes­sage,” mean­ing sign the EU’s Asso­ci­a­tion Agree­ment, which Kiev had refused to do last week, in spite of mas­sive Ger­man pres­sure. To gain influ­ence in the coun­try, Ger­many has for years been sup­port­ing the “pro-European” alliance in the Ukraine. The alliance includes not only con­ser­v­a­tive par­ties, but also forces from the extreme right — because of their strength, par­tic­u­larly in west­ern Ukraine, where a cult around for­mer Nazi col­lab­o­ra­tors is man­i­fest­ing itself. The All-Ukrainian Union “Svo­boda” party is par­tic­u­larly embed­ded in the national-chauvinist milieu, under the influ­ence of this cult. Over the past few days, the party’s leader has called for a “rev­o­lu­tion” in Kiev. Oleh Tiah­ny­bok, the leader of the ultra-rightwing Svo­boda (Free­dom) party is quoted say­ing “a rev­o­lu­tion is begin­ning in the Ukraine.” Tiah­ny­bok made this procla­ma­tion in Kiev dur­ing the cur­rent protest demon­stra­tions. On the week­end, approx. 100,000 peo­ple took to the streets protest­ing against the cur­rent government’s for­eign pol­icy course, and call­ing for the coun­try to become asso­ci­ated with the EU. Dur­ing their con­tin­u­ing — and increas­ingly vio­lent — demon­stra­tions, pro­test­ers are call­ing on the gov­ern­ment to stop refus­ing to sign the Asso­ci­a­tion Agree­ment with the EU. Accord­ing to media reports, numer­ous activists from ultra-rightwing orga­ni­za­tions are par­tic­i­pat­ing in the demon­stra­tions, par­tic­u­larly activists from Svo­boda. The party’s leader Tiah­ny­bok is bask­ing in the atten­tion he is receiv­ing from the inter­na­tional press. He is plan­ning a gen­eral strike to accom­plish the “rev­o­lu­tion” he announced last weekend. He can rely on ultra-rightwing forces, whose influ­ence has grown over the past few years. The resur­gence of the cult around the for­mer Ukrain­ian Nazi col­lab­o­ra­tors, since the mid-1980s, has helped ultra-rightwing forces to enlarge their influ­ence in west­ern Ukraine and in Kiev. This cult focuses par­tic­u­larly on Stepan Ban­dera, a leader of the Orga­ni­za­tion of Ukrain­ian Nation­al­ists (OUN). The OUN joined forces with the Nazis dur­ing the inva­sion of the Soviet Union in June 1941. “Along with Ger­man units, our mili­tias are mak­ing numer­ous arrests of Jews,” wrote the OUN’s pro­pa­ganda unit fol­low­ing the inva­sion of Lviv: “Before their liq­ui­da­tion, the Jews had used every method to defend themselves.“ While Lviv’s Jew­ish pop­u­la­tion was falling prey to pogroms and mas­sacres in the city, Ban­dera was pro­claim­ing the estab­lish­ment of a Ukrain­ian nation. One spe­cial­ist explained in ref­er­ence to Bandera’s attempt to pro­claim a nation, that today, Ban­dera and the OUN play a “very impor­tant” role in the “eth­nic self-identity” of West Ukraini­ans. The OUN is seen “less as a fas­cist party” than “as the cli­max of a national lib­er­a­tion move­ment, or a fra­ter­nity of coura­geous heroes in Ukrain­ian national history.“ Since the begin­ning of the 1990s, numer­ous mon­u­ments to Ban­dera have been erected through­out the coun­try. One such mon­u­ment crowns the “Boule­vard Stapan Ban­dera” in Lviv’s center. Accord­ing to analy­ses, a, “for the most part, infor­mally func­tion­ing nation­al­ist civil soci­ety” has been cre­ated around the Ban­dera cult, par­tic­u­larly in West Ukraine. As far back as the 1990s, this milieu has pro­duced var­i­ous ultra-rightwing orga­ni­za­tions. In 1990, the UNA Party (“Ukrain­ian National Assem­bly”) was founded, form­ing a para­mil­i­tary wing (the “Ukrain­ian National Self-Defense” — UNSO) in 1991. Yuri Shukhevych, the son of Roman Shukhevych, a Nazi col­lab­o­ra­tor, was one of its first lead­ers. Soon the “Con­gress of Ukrain­ian Nation­al­ists” (CUN) fol­lowed, which elected the for­mer OUN activist Slava Stet­sko to the Ukrain­ian Par­lia­ment in 1997. As Pres­i­dent by Senior­ity, Stet­sko had the honor of deliv­er­ing the open­ing address at the Verk­hovna Rada (Ukrain­ian Par­lia­ment) after the 1998 elec­tions. After 1945, Stet­sko had con­tin­ued to pur­sue her Ukrain­ian activ­i­ties from her exile in Munich. It was also in Munich that, since 1948, the “Ukrain­ian National Coun­cil” had held its meet­ings — in the phys­i­cal and polit­i­cal prox­im­ity of Ger­man and US intel­li­gence ser­vices. The National Coun­cil con­sid­ered itself to be the “core of the Ukrain­ian state in exile.“ Already in 1998, the CUN received — in elec­toral alliances with other par­ties — 9.7 per­cent of the votes in Lviv, 20.9 per­cent in Ternopil and 23.8 per­cent in Ivano-Frankivsk. At the time, the “Social National Party of the Ukraine” (SNPU), which was co-founded in Lviv in 1991 by Oleh Tiah­ny­bok and had vio­lent neo-Nazi mem­bers, was not yet suc­cess­ful in elec­tions. In 1998 Tiah­ny­bok was voted into the Ukrain­ian par­lia­ment with a direct man­date. Only after the SNPU changed its name to the “All-Ukrainian Union ‘Svo­boda’ (‘Free­dom’) in 2004, did it become more suc­cess­ful in elec­tions and the leader of Ukraine’s ultra-rightwing forces. At the time, politi­cians, who had been closely coop­er­at­ing with Berlin, par­tic­u­larly Vik­tor Yushchenko (Ukrain­ian Pres­i­dent 2005–2010), had been engaged in activ­i­ties aimed at form­ing a broad anti-Russian alliance to inte­grate the Ukraine into the Ger­man hege­monic sphere — thereby strength­en­ing the ultra-rightwing forces. For the elec­tions in 2002 and 2006, Yushchenko’s elec­toral plat­form “Our Ukraine” coop­er­ated with CUN and enabled that orga­ni­za­tion to win three seats in the national par­lia­ment in both elec­tions. Oleh Tiah­ny­bok (Svo­boda) had tem­porar­ily been a mem­ber of the “Our Ukraine” par­lia­men­tary group. He was excluded in the sum­mer of 2004, fol­low­ing his speech at the grave of a Nazi col­lab­o­ra­tor, in which he ranted against the “Jew­ish mafia in Moscow.” That same year, Yushchenko announced that, if elected, he would offi­cially declare Ban­dera “Hero of the Ukraine.” This did not impede Berlin’s sup­port. With the “Orange Rev­o­lu­tion,” Berlin also helped him to ulti­mately be elected Pres­i­dent. Yushchenko declared Nazi col­lab­o­ra­tor Roman Shukhevych on Octo­ber 12, 2007, and Ban­dera on Jan­u­ary 22, 2010 “Heroes of the Ukraine” — as a favor to the broad anti-Russian Alliance. At that time, Svo­boda had just received its first major elec­toral suc­cess: In the March 15 regional par­lia­men­tary elec­tions in Ternopil, with 34.7 per­cent and 50 out of 120 par­lia­men­tar­i­ans, includ­ing the pres­i­dent of par­lia­ment, it emerged the strongest party. To secure the broad­est pos­si­ble base for their anti-Russian pol­icy, the so-called pro-European Ukrain­ian par­ties are still coop­er­at­ing with ultra rightwing forces. “Batkivschyna” (Father­land), the party of impris­oned oppo­si­tion politi­cian Yulia Tymoshenko has entered an elec­toral alliance with Svo­boda in the run-up to the last elec­tions. Thanks to this alliance, Svo­boda was able to obtain 10.4 per­cent of the votes and twelve direct man­dates and is now rep­re­sented in the Verk­hovna Rada with 37 par­lia­men­tar­i­ans. A firm oppo­si­tion coali­tion was formed, which included Svo­boda, Batkivschyna and Vitaly Klitschko’s “UDAR” party. This coali­tion is not only closely coop­er­at­ing in the Ukrain­ian par­lia­ment but also in the cur­rent protest demon­stra­tions on the streets. Batkivschyna has “sig­nif­i­cantly aided Svo­boda to become socially accept­able,” accord­ing to an expert, but it can­not be ruled out that it thereby also “dug its own grave.” Already at the 2012 elec­tions, Tymoshenko’s party lost some of its “vot­ers to the rad­i­cal nation­al­ists” because of its coop­er­a­tion with Svoboda. The dynamic of rad­i­cal­iza­tion of the cur­rent protests could invig­o­rate this devel­op­ment — aided by Berlin’s active encouragement. With its grow­ing strength, Svo­boda is also gain­ing influ­ence on a Euro­pean level. Since the 1990s, the party has sys­tem­at­i­cally devel­oped con­tacts to var­i­ous ultra-rightwing par­ties in other Euro­pean coun­tries. For quite a while, it had been coop­er­at­ing closely with the French Front National until the FN began to cul­ti­vate a “more mod­er­ate” image. Up to the begin­ning of this year, Svo­boda had par­tic­i­pated in a net­work that also included the “British National Party” and Hungary’s “Job­bik.” It has been seek­ing closer ties to the neo-fascist “Forza Nuova” in Italy and the Ger­man NPD. But, it is also estab­lish­ing its own party struc­tures in other Euro­pean coun­tries. Last August, it founded a party cell in Munich chaired by a Svo­boda city coun­cil mem­ber from Ivano-Frankivsk, who is cur­rently study­ing in the Bavar­ian cap­i­tal. Fol­low­ing its foun­da­tion cer­e­mony, the new party cell vis­ited the Munich Wald­fried­hof, indi­cat­ing a tra­di­tional link between Munich and the Ukraine: the two OUN lead­ers Jaroslav Stet­sko and Stepan Ban­dera are buried in this ceme­tery. In a press release, the party’s new cell announced that the visit had been made “in honor of those, who had died for the inde­pen­dence of the Ukraine.“ Sub­se­quent to their unsuc­cess­ful Nazi-collaboration, both had con­tin­ued their strug­gle for Ukraine’s seces­sion from the Soviet Union and inte­gra­tion into the Ger­man Fed­eral Republic’s hege­monic sphere of influence. 2a. Note the primary role of Swoboda in the Ukrainian demonstrations and their role in precipitating the Russian crackdown. “Ukraine’s Forces Move Against Pro­test­ers, Dim­ming Hopes for Talks” by David M. Her­szen­horn; The New York Times; 12/9/2013. . . . . On Mon­day evening, Ukrain­ian secu­rity forces raided the head­quar­ters of an oppo­si­tion party, Father­land, and seized com­puter servers. The party’s par­lia­men­tary leader, Arseniy P. Yat­senyuk, is one of the main orga­niz­ers of the protest move­ment, which bal­looned in recent days to dom­i­nate the streets of Kiev and pres­sure Mr. Yanukovich after he refused to sign a polit­i­cal and trade pact with the Euro­pean Union. Father­land is best known, how­ever, as the oppo­si­tion coali­tion formed by the jailed for­mer prime min­is­ter, Yulia V. Tymoshenko, whose release has long been demanded by West­ern leaders. . . . .
. . . . Despite the action against Mr. Yatsenyuk’s party, Father­land, the author­i­ties seemed to be hold­ing back from sim­i­lar inves­ti­ga­tions of the other two par­lia­men­tary lead­ers at the fore­front of the protests, the cham­pion boxer Vitali Klitschko, of the UDAR party, and Oleg Tyag­ni­bok, of the nation­al­ist Svo­boda party. Mr. Tyagnibok’s sup­port­ers in par­tic­u­lar are among the most fear­some demon­stra­tors and have led some of the more provoca­tive efforts to occupy build­ings and block gov­ern­ment offices. . . .
2b. A hacked phone call suggests the possibility that the snipers that fired on the demonstrators were agent-provacateurs working for the Swoboda/Pravy Sektor coalition. “Estonian Foreign Ministry Confirms Authenticity of Leaked Phone Call Discussing How Kiev Snipers Who Shot Protesters Were Possibly Hired by Ukraine’s New Leaders” by John Hall; Daily Mail [UK]; 3/5/2014. But while the Baltic state acknowledged the audio was genuine, it denied that it had blamed opponents of Ukraine’s deposed president for sniper killings during last month’s unrest. . . .
. . . . .A spokeswoman for Ashton declined to comment on the leaked conversation. The Russian Foreign Ministry has not reacted officially, but Itar-Tass news agency quoted a source at the ministry on Wednesday as saying that Moscow was ‘surprised’ that the EU was not commenting on the intercepted phone chat. 3a. Swoboda organized a march in commemoration of the OUN/B on Bandera’s birthday, recognizing their direct political lineage with his organiztion. “15,000 Ukraine Nation­al­ists March for Divi­sive Ban­dera” [AP]; USA Today; 1/1/2014. . . . . About 15,000 peo­ple marched through Kiev on Wednes­day night to honor Stepan Ban­dera, glo­ri­fied by some as a leader of Ukraine’s lib­er­a­tion move­ment and dis­missed by oth­ers as a Nazi collaborator. Ban­dera, who died 55 year ago, remains a deeply divi­sive fig­ure in Ukraine, glo­ri­fied by many in west­ern Ukraine as a free­dom fighter but dis­missed by mil­lions in east­ern and south­east­ern Ukraine as a trai­tor to the Soviet Union’s strug­gle against the occu­py­ing German army. The nation­al­ist party Svo­boda, which orga­nized Wednesday’s rally, was one of the key forces behind the protests, but other oppo­si­tion fac­tions have said the Ban­dera rally is unre­lated to the ongo­ing protest encamp­ment in central Kiev. . . .
3b. We note that a street in Lviv, formerly named “Peace Street,” has been renamed after the Einsatzgruppe Nachtigall, the OUN/B-Nazi formation that exterminated the Jewish population of that city. An Anarchist group called AntiFascist Union Ukraine attempted to join the Euromaidan demonstrations but found it difficult to avoid threats of violence and imprecations from the gangs of neo-Nazis roving the square. “They called the Anarchists things like Jews, blacks, Communists,” one of its members said. “There weren’t even any Communists, that was just an insult.” . . .
. . . One of the “Big Three” political parties behind the protests is the ultra-nationalist Svoboda, whose leader, Oleh Tyahnybok, has called for the liberation of his country from the “Muscovite-Jewish mafia.” After the 2010 conviction of the Nazi death camp guard John Demjanjuk for his supporting role in the death of nearly 30,000 people at the Sobibor camp, Tyahnybok rushed to Germany to declare him a hero who was “fighting for truth.” In the Ukrainian parliament, where Svoboda holds an unprecedented 37 seats, Tyahnybok’s deputy Yuriy Mykhalchyshyn is fond of quoting Joseph Goebbels – he has even founded a think tank originally called “the Joseph Goebbels Political Research Center.” According to Per Anders Rudling, a leading academic expert on European neo-fascism, the self-described “socialist nationalist” Mykhalchyshyn is the main link between Svoboda’s official wing and neo-Nazi militias like Right Sector. Following the demise of Yanukovich this month, the UCCA helped organize rallies in cities across the US in support of the EuroMaidan protests. When several hundred demonstrators marchedthrough downtown Chicago, some waved Ukrainian flags while others proudly flew the red and black banners of the UPA and OUN-B. “USA supports Ukraine!” they chanted. 4. Pravy Sektor (“Right Sector”) is another of the primary elements of Euromaidan. It, too, openly professes its political and historical lineage as deriving from the OUN/B forces. Even as Ukraine’s main oppo­si­tion lead­ers meet with the author­i­ties to try to resolve their long-running stand­off, one influ­en­tial and unre­pen­tant voice stands out — that of far-right para­mil­i­tary leader Dmytro Yarosh. “The rev­o­lu­tion will win in Ukraine!” the shaven-headed 42-year-old told AFP in a rare inter­view at his field head­quar­ters — an entire floor in an occu­pied trade union build­ing on Inde­pen­dence Square in central Kiev. He said that his group does not have its own arse­nal but that he had autho­rised a “secret” num­ber of indi­vid­ual mem­bers with weapons per­mits to cre­ate “an armed protection unit”. Asked if he is con­cerned about being put in prison, Yarosh strikes a defiant tone. 5a. The lat­est post from german-foreign-policy.com notes the Vitali Klitschko has endorsed the pos­si­ble use of force, rely­ing on the OUN/B-evolved mil­i­tants as, in effect, enforcers. With a shrill amen cho­rus dis­cussing the “anti-Democratic,” and/or “extreme” nature of the Yanukovich government’s response to mur­der­ous behav­ior on the part of polit­i­cal oppo­nents, we are being treated to a fun­da­men­tal per­ver­sion of polit­i­cal cognition. FACT: armed ele­ments of the oppo­si­tion coali­tion opened fire on gov­ern­ment secu­rity forces, killing a num­ber of them. FACT: Nowhere on earth are secu­rity forces going to react benignly to the use of deadly force on mem­bers of their ranks. QUICK: What U.S. police or mil­i­tary forces would NOT shoot back, if fired upon? Note again the close German coordination with Ukrainian opposition elements. “At All Costs;” german-foreign-policy.com; 2/19/2014. Yes­ter­day, the day after the Ger­man Chan­cel­lor held delib­er­a­tions with two lead­ers of the Ukrain­ian oppo­si­tion, protests in Kiev esca­lated into bloody con­fronta­tions. Demon­stra­tors, uncon­di­tion­ally spon­sored by Ger­many and other west­ern coun­tries for months, began, over the past few days, to arm them­selves with firearms and ammu­ni­tion. Two police offi­cers were shot to death dur­ing yesterday’s upris­ing. This esca­la­tion into a bloody con­fronta­tion fol­lowed on the heels of gov­ern­ment com­pli­ance with a fun­da­men­tal demand of the demon­stra­tors, just as it seemed that a de-escalation was about to begin — to the tac­ti­cal dis­ad­van­tage of the “Ger­mans’ man” in Kiev, Vitali Klitschko, who has been call­ing for the pres­i­dent to resign. Klitschko, who flew to Berlin Mon­day, to dis­cuss the next steps, threat­ened an even more bloody esca­la­tion and declared, that he does not “rule out the use of force in the evac­u­a­tion of the Maidan.” One of the orga­ni­za­tions he is rely­ing on is explic­itly named after Nazi col­lab­o­ra­tors, who had car­ried out mass-murder of Soviet Jews. Esca­la­tion strate­gies, such as those cur­rently imple­mented in Kiev, are not alien to Ger­man for­eign policy. In the course of yesterday’s bloody esca­la­tion of the protests, sev­eral police offi­cers and demon­stra­tors were killed in Kiev. As was con­firmed by news reports, there have been clear indi­ca­tions since some time that some of the demon­stra­tors in Kiev had begun arm­ing them­selves. It was reported that for days, a group call­ing itself the “First Hun­dred Group in Kiev of the Orga­ni­za­tion of Ukrain­ian Nation­al­ists” were pub­licly ask­ing for “ammu­ni­tion or money to buy it.“ Just pre­vi­ously, the Berlin-supported leader of the oppo­si­tion, Vitali Klitschko, called for form­ing mili­tias. Yes­ter­day, the fascist-interspersed, violence-prone, “Right Block” called on all oppo­nents of the gov­ern­ment in the pos­ses­sion of firearms to come to the Maidan. In their attempt to storm the Ukrain­ian Par­lia­ment, gov­ern­ment oppo­nents broke through police bar­ri­cades and set police cars on fire. Heavy clashes erupted between the armed demon­stra­tors and police. Par­lia­men­tar­i­ans seek­ing to flee the build­ing were clubbed in their cars; the office of the gov­ern­ing party was set on fire. Whereas demon­stra­tors claim that ambu­lances were impeded by the police in action, the wounded appar­ently were not treated because of the bar­ri­cades set up by the demonstrators. Dur­ing the night, the sit­u­a­tion esca­lated further. This esca­la­tion into a bloody con­fronta­tion occurred the day after oppo­si­tion lead­ers Arseniy Yat­senyuk and Vitaly Klitschko had had an audi­ence in Berlin’s Chan­cellery, where they dis­cussed with Angela Merkel the next steps the gov­ern­ment oppo­nents should take. The plea by the “First Hun­dred Group in Kiev of the Orga­ni­za­tion of Ukrain­ian Nation­al­ists” for ammu­ni­tion could not have not been known to them at the time of their meet­ing. The plea had not been made clan­des­tinely, but was pub­licly dis­played on a poster. Appar­ently, nei­ther the Chan­cel­lor nor the Min­istry of For­eign Affairs had insisted that fur­ther offen­sive protest demon­stra­tions be held back, to avoid the worst, until the arms buildup of the oppo­si­tion could be reversed. On the con­trary, as usual, the Ger­man For­eign Min­is­ter crit­i­cized “the vio­lence” in Kiev, gen­er­ally and specif­i­cally that ema­nat­ing from state forces. The fact that the demon­stra­tors, under the lead­er­ship Berlin’s Klitschko, is largely com­prised of fas­cists, is not even men­tioned in the Ger­man gov­ern­ment dec­la­ra­tion. The “First Hun­dred Group in Kiev of the Orga­ni­za­tion of Ukrain­ian Nation­al­ists,” for exam­ple, is a his­tor­i­cal ref­er­ence to the “Orga­ni­za­tion of Ukrain­ian Nation­al­ists,” who, at the side of Nazi Germany’s Wehrma­cht, helped invade the Soviet Union and, among other crimes, actively par­tic­i­pated in Nazi mass mur­ders of Jews. (german-foreign-policy.com reported.) . . .
. . . . The esca­la­tion in Kiev came at pre­cisely the point, where the Ukrain­ian gov­ern­ment accepted a cen­tral demand of the pro­tes­tors, declar­ing an amnesty for the arrested demon­stra­tors. “Signs of a slight relax­ation of ten­sions” were “not to be over­looked,” accord­ing to reports in the Ger­man media, which then indi­cated that spe­cial units of the police were being pulled back and law enforce­ment offi­cers had begun dis­man­tling bar­ri­cades and tow­ing away burned out police cars. How­ever, this also removed the means of lever­age for all those who, like “the German’s man” in Kiev, Klitschko — sought to force Pres­i­dent Vik­tor Yanukovych to resign. Out of the esca­la­tion into vio­lent con­fronta­tion, the Ger­man For­eign Min­is­ter now con­cludes that “Europe’s restraint, exer­cised in its deci­sion to impose per­son­nel sanc­tions” — on politi­cians in Kiev — “will cer­tainly now be reconsidered.“ Wash­ing­ton recently crit­i­cized Berlin and the EU for not hav­ing put enough pres­sure on the Ukrain­ian government. . . . .
5b. Germany Watch–which feeds along the right-hand side of the front page of this web site–notes that the potential agreement with the EU would have been economically destructive for both the Ukraine and Russia, as well as putting NATO military forces at Russia’s border. The post excerpted below also notes that some 350 jihadists fighting for the Muslim Brotherhood-affiliated elements in Syria joined the street fighting on behalf of the Swoboda/Pravy Sektor combatants. . . . . In his formal remarks at Munich and a week earlier at the World Economic Forum at Davos, Switzerland, Russian Foreign Minister Sergei Lavrov assailed Western governments for supporting neo-Nazi terrorist organizations in their zeal to place Ukraine under European Union and Troika control to tighten the NATO noose around Russia. 6. Note that some European politicians are aware of the nature of the OUN/B heritage of opposition forces in the Ukraine. It appears that Swoboda and Pravy Sektor are only two of some 23 extremist groups in the Ukraine, effectively controlling roughly 44% of the population. The Swoboda party has networked with the Hungarian Jobbik party, the heir to the Arrow-Cross fascists allied with Germany during World War II. Like the OUN/B, Arrow-Cross was well represented both in the GOP’s ethnic outreach program and the Free Congress Foundation. The story below also notes the fact that Yanukovich was fundamentally corrupt and incompetent–a quality he shares with the vast bulk of the leaders of the former Soviet Republics and much of the rest of the world’s politicl elite. “Tea With Neo-Nazis: The Vio­lent Nation­al­ism in Ukraine” by Dr. Inna Rogatchi; Israel National News; 2/21/2014. Dur­ing these [May 2014] elec­tions, pan-European ultra-right rad­i­cals will try to hijack Europe once again; and the sit­u­a­tion has not been this seri­ous in Europe since pre-WWII. The most wor­ri­some and largely over­seen fac­tor of the ongo­ing Ukrain­ian tragedy, to me, is the mighty pres­ence among the oppo­si­tion hard-core mil­i­tants from ultra-right nation­al­is­tic par­ties and move­ments there. The threat which is posed by those forces shall be not under-estimated, espe­cially in the con­text of rapidly ris­ing ultra-national forces all over Europe, a new ugly ‘fash­ion’ of nowadays. . . . But today, 75 years after the Holo­caust began, there is no way of play­ing igno­rance as a lead card, one that is actu­ally cov­er­ing indif­fer­ence, often sim­ple cow­ardice, and a strangely aloof atti­tude towards the recently risen clear and pal­pa­ble threat of deter­mined race hatred sweep­ing over all of Europe, – about which nei­ther the Euro­pean Par­lia­ment, or the Coun­cil of Europe, nor any other sup­pos­edly pow­er­ful inter­na­tional orga­ni­za­tion is doing any­thing real to stop and erad­i­cate as they should. –“I have been six times in Ukraine dur­ing the last two months, what a tragedy is going on there”, — a senior Euro­pean politi­cian told me recently. –I asked him : “Have you noticed the activ­i­ties of ultra-right rad­i­cals there? Have you heard what they are pro­claim­ing and under which slo­gans they are ‘fight­ing for democ­racy’, so to say?”. –“Yes, that Svo­boda ( Free­dom) party, I know, it is a night­mare, by the way”. – “Yes, it is very seri­ous” – my friend sud­denly sounded alarmed, “it should be taken into seri­ous con­sid­er­a­tion, of course”. – “ Really?.. No, I did not know that. Oh, that’s very impor­tant. That’s really bad”, and now he was thor­oughly alarmed. My friend flew to Ukraine the next morn­ing for the sev­enth time in two months. He joined the urgent sum­mit of the for­eign min­is­ters of Ger­many, France and Poland there as the high­est level of the Euro­pean diplo­macy was urgently try­ing to save the sit­u­a­tion that has gone out of con­trol and beyond of the point of no return. We already know that the sum­mit was another dia­logue between the deaf and the blind. But I do hope that as a hon­est man and an effi­cient inter­na­tional politi­cian, my friend will con­tinue to pur­sue the case that he and I were dis­cussing with mutu­ally shared seri­ous worry not only for Ukraine, but regard­ing the entire face and des­tiny of Europe in the near future, after the com­ing Euro­pean elec­tions in May 2014. Dur­ing these elec­tions, pan-European ultra-right rad­i­cals will try to hijack Europe once again; and the sit­u­a­tion has not been this seri­ous in Europe since the pre-WWII time, for a fact. . . .
. . . . In Ukraine, the Janukovich-led regime has been mas­sively cor­rupt, the pres­i­dent him­self hap­pens to be a con­victed crim­i­nal, and his clique fully cor­re­sponds to those mar­vel­lous qual­i­ties. Still, it is the same Ukrain­ian peo­ple who did vote for him; the same way peo­ple in Venezuela kept vot­ing for their Orwellian pres­i­dents, one after another. Any expert on Ukraine would tell you that all the pre­vi­ous Ukrain­ian regimes were, quite sim­i­larly, utterly cor­rupted, as has always been the case for this coun­try. Only names and influ­en­tial groups have changed dur­ing the 22 years of the country’s inde­pen­dence, but not their slo­gans, ways and methods. . . .
“Euro­maidan: The Dark Shad­ows of the Far-Right in Ukraine Protests” by Palosh Ghosh; Inter­na­tional Busi­ness Times; 2/25/2014. . . . . Founded in 1991 as the Social-National Party of Ukraine, Svo­boda has appar­ently appealed to hun­dreds of thou­sands of Ukraini­ans tired of eco­nomic woes and ram­pant cor­rup­tion in gov­ern­ment. Reports also sug­gest that the party has derived sig­nif­i­cant sup­port from the well edu­cated and the young, who suf­fer from high unem­ploy­ment. . . . .
7b. Another International Business Times also highlights the virulent anti-Semitism of Swoboda and their attitude toward Mila Kunis. “Svo­boda: The Ris­ing Spec­tre of Neo-Nazism in the Ukraine” by Palosh Ghosh; The Inter­na­tional Busi­ness Times; 12/27/2013. . . . . Ihor Mirosh­ny­chenko, the deputy chief of Svo­boda, wrote on his Face­book account: “[Kunis] is not Ukrain­ian, she is a Yid. She is proud of it, so [the] Star of David be with her.” . . . .
8. Many key ministerial posts in the new Ukrainian government have been filled by Swoboda and Pravy Sektor, the political heirs to the OUN/B. The supervision of the military and the judicial process is under the sway of those parties. 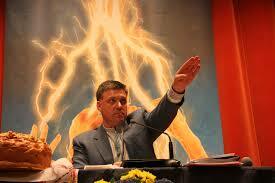 “How the Far-Right Took Top Posts in Ukraine’s Power Vac­uum”; Chan­nel 4 News [UK]; 3/5/2014. The man fac­ing down Putin’s aggres­sion as sec­re­tary of the Ukrain­ian National Secu­rity and Defence Coun­cil is Andriy Paru­biy. He over­sees national secu­rity for the nation hav­ing pre­vi­ously served as secu­rity com­man­dant dur­ing the anti-government protests in Kiev. Paru­biy was the founder of the Social National Party of Ukraine, a fas­cist party styled on Hitler’s Nazis, with mem­ber­ship restricted to eth­nic Ukrainians. The Social National Party would go on to become Svo­boda, the far-right nation­al­ist party whose leader Oleh Tyah­ny­bok was one of the three most high pro­file lead­ers of the Euro­maidan protests — nego­ti­at­ing directly with the Yanukovych regime. Over­see­ing the armed forces along­side Paru­biy as the Deputy Sec­re­tary of National Secu­rity is Dmytro Yarosh, the leader of the Right Sec­tor — a group of hard­line nation­al­ist street­fight­ers, who pre­vi­ously boasted they were ready for armed strug­gle to free Ukraine. . . .
. . . .The new Deputy Prime Min­is­ter Olek­sandr Sych is a mem­ber of the far-right Svo­boda party, which the World Jew­ish Con­gress called on the EU to con­sider ban­ning last year along with Greece’s Golden Dawn. The party, which has long called for a “national rev­o­lu­tion” in Ukraine, has endured a long march from rel­a­tive obscu­rity in the early 90s. Their dec­la­ra­tion that Ukraine is con­trolled by a “Muscovite-Jewish mafia” has raised fears for the safety of the country’s Jew­ish population. Svo­boda now con­trols the ecol­ogy and agri­cul­tural min­istry with Andriy Mokhnyk, the deputy head of Svo­boda, run­ning ecol­ogy and Ihor Shvaika as agri­cul­ture min­is­ter. Asso­ciate pro­fes­sor at Lund Uni­ver­sity Pers Anders Rudling, an expert on Ukrain­ian extrem­ists, told Chan­nel 4 News that there are other min­is­ters who are also closely in the orbit of Svoboda. “Two weeks ago I could never have pre­dicted this. A neo-fascist party like Svo­boda get­ting the deputy prime min­is­ter posi­tion is news in its own right. “There are seven min­is­ters with links to the extreme right now. It began with Svo­boda get­ting 10 per cent of the vote in the last elec­tion, it is cer­tainly a con­cern in the long run.” . . . .
. . . . Svo­boda mem­ber Oleh Makhnit­sky is now act­ing pros­e­cu­tor gen­eral. The ini­tial actions of the interim gov­ern­ment have included forc­ing mak­ing Ukrain­ian the only offi­cial lan­guage of the nation and mak­ing moves to remove a law which for­bids “excus­ing the crimes of fascism”. . . .
9. We note that the chants used by the opposition, including the “moderate” Vitali Klitschko, are those of the OUN/B. “The Ukrain­ian Nation­al­ism at the Heart of ‘Euro­maidan’” by Alec Luhn; The Nation; 1/21/2014. . . . . Svo­boda is the most vis­i­ble party on the square, it has essen­tially taken over Kiev City Hall as its base of oper­a­tions, and it has a large influ­ence in the pro­tes­tors’ secu­rity forces. It also has revived three slo­gans orig­i­nat­ing in the Ukrain­ian nation­al­ist move­ment of the 1930s [i.e. the OUN/B–D.E.] that have become the most pop­u­lar chants at Euro­maidan. Almost all speak­ers on Inde­pen­dence Square—even boxer-turned-opposition-leader Vitaly Klitschko, who has lived mostly in Ger­many and has a US res­i­dence permit—start and end with the slo­gan, “Glory to Ukraine!,” to which the crowd responds “To heroes glory!” Two other nation­al­ist call-and-response slo­gans often heard on the square are “Glory to the nation! Death to ene­mies!” and “Ukraine above all!” . . .
10. Continuing the GOP’s tradition of networking with OUN/B elements, John McCain was networking with Oleh Tyah­ny­bok, leade of Swoboda. Ukraine’s pro-EU protests show no sign of stop­ping – US Sen­a­tor John McCain dined with oppo­si­tion lead­ers this week­end, includ­ing the extreme far-right Svo­boda party. 10. Pierre Omid­yar–Glenn Greenwald’s finan­cial angel–helped finance the Ukrain­ian coup, along with AID. The lat­ter is a fre­quent cover for U.S. intel­li­gence activities. KIEV, Ukraine — Ukraine may have to arm itself with nuclear weapons if the United States and other world powers refuse to enforce a security pact that obligates them to reverse the Moscow-backed takeover of Crimea, a member of the Ukraine parliament told USA TODAY. The United States, Great Britain and Russia agreed in a pact “to assure Ukraine’s territorial integrity” in return for Ukraine giving up a nuclear arsenal it inherited from the Soviet Union after declaring independence in 1991, said Pavlo Rizanenko, a member of the Ukrainian parliament. His statements come as Russia raised the possibility it may send its troops beyond the Crimean peninsula on the Black Sea into the eastern half of Ukraine. The Russian Foreign Ministry said lawlessness “now rules in eastern regions of Ukraine as a result of the actions of fighters of the so-called ‘right sector’ with the full connivance” of Ukraine’s authorities. Rizanenko and others in Ukraine say the pact it made with the United States under President Bill Clinton was supposed to prevent such Russian invasions. The pact was made after the Soviet Union dissolved in 1991 and became Russia, leaving the newly independent nation of Ukraine as the world’s third largest nuclear weapons power. The communist dictatorship that was the Soviet Union had based nuclear missiles in republics it held captive along its border with Europe, and Ukraine had thousands. World powers urged Ukraine to give up the arsenal but its leaders balked, expressing fear they needed the weapons to deter Russia from trying to reverse Ukraine’s independence. To reassure the Ukrainians, the United States and leaders of the United Kingdom and Russia signed in 1994 the “Budapest Memorandum on Security Assurances” in which the signatories promised that none of them would threaten or use force to alter the territorial integrity or political independence of Ukraine. They specifically pledged not to militarily occupy Ukraine. Although the pact was made binding according to international law, it said nothing that requires a nation to act against another that invades Ukraine. The memorandum requires only that the signatories would “consult in the event a situation arises which raises a question concerning these commitments.” Ukraine gave up thousands of nuclear warheads in return for the promise. There is little doubt that Russia has in fact placed its military forces in Ukraine’s province of Crimea. Russia’s foreign minister has said its troops are there to protect Russian lives and interests. President Obama has talked to Putin over the phone and said there is no danger to Russians in Ukraine and that they should agree to let international forces enter Crimea so differences can be resolved peacefully, according to the White House. But Putin insisted to Obama that ethnic Russians in Crimea needed protection and reiterated that the government in Kiev is illegal because the parliament ousted pro-Moscow President Viktor Yanukovych. “Everyone had this sentiment that for good or bad the United States would be the world police” and make sure that international order is maintained, Rizanenko said of the Budapest pact. “Now that function is being abandoned by President Obama and because of that Russia invaded Crimea,” he said. The White House and U.S. State Department did not respond to e-mails requesting comment. The engineers of the OUN/B Redux may find they’ve created a Frankenstein’s monster, if this isn’t empty rhetoric dispensed for propaganda purposes. Pravy Sektor/Swoboda with nukes! Swell. The following is a communication by a German reader to the author a pro-Russian blog (in the context of the Ukraine crisis), outlining the German government’s active role in the events since the end of last year. The comments make for an interesting read as well. In April, prosecutors arrested three suspects, members of an elite unit within the “Berkut” riot police. Senior among them was Dmytro Sadovnyk, 38, a decorated commander, who was accused of ordering his men to fire on the crowds on the morning of Feb. 20. The three stand accused of massacring 39 unarmed protesters. But in a country where justice often isn’t blind, there’s another possibility: Sadovnyk was being framed, and saw flight as his best option. In court last month, he called the case against him “a political lynching.” In the days before he vanished, his wife and his lawyer say, Sadovnyk and his family received death threats. A Reuters examination of Ukraine’s probes into the Maidan shootings – based on interviews with prosecutors, defence attorneys, protesters, police officers and legal experts – has uncovered serious flaws in the case against Sadovnyk and the other two Berkut officers. Among the evidence presented against Sadovnyk was a photograph. Prosecutors say it shows him near Kiev’s Independence Square on Feb. 20, wearing a mask and holding a rifle with two hands, his fingers clearly visible. The problem: Sadovnyk doesn’t have two hands. His right hand, his wife told Reuters, was blown off by a grenade in a training accident six years ago. As prosecutors introduced the image at a hearing in April, said Yuliya Sadovnyk, her husband removed a glove and displayed his stump to the courtroom. The probes into the killings have been hindered by missing evidence. Many guns allegedly used to shoot protesters have vanished; many of the bullets fired were taken home as souvenirs. Barricades, bullet-pierced trees and other items of forensic evidence were removed, lawyers say. A former Berkut commander told Reuters that Berkut officers destroyed documentary evidence that potentially could identify fellow officers. They did so, he said, because they feared the Berkut’s headquarters would be attacked by a mob of revenge-seeking protesters after Yanukovich fled to Russia. The former president isn’t the only key figure missing. In an interview before Sadovnyk vanished, Ukraine’s general prosecutor, Vitaly Yarema, said investigators had identified 17 Berkut officers as alleged participants in the protester shootings, based on surveillance camera videos and mobile-phone location data. Of the 17, he said, 14 had fled to Russia or Crimea, including the Berkut’s top commander in Kiev. Sadovnyk and his two co-defendants were the only identified suspects who had remained behind. Independence Square was the rallying point in Kiev where the anti-Yanukovich revolution largely unfolded between November and February. (The word Maidan means “square” in Ukrainian.) The killings there quickly were recognised as a milestone in modern Ukrainian history, part of a chain of events that set off a separatist conflict and Russian incursions that have shaken the country to its core. Videos and photographs appear to show how Berkut officers shot at protesters and beat them with sticks. In one video, the Berkut are seen making a man stand naked in the snow. The public is demanding answers and justice. But the investigations are testing Ukraine’s ability to rise above the kinds of failings that have hobbled the country ever since its independence from the Soviet Union in 1991. In contrast to, say, Poland, Ukraine has never gelled into a robust state. Kiev has had two revolutions since independence. A host of endemic problems – political corruption, racketeering, a divide between speakers of Ukrainian and Russian – have left it feeble and fractious. Another of the state’s chief failings, outside observers say, is a broken justice system. Under Yanukovich and his rivals before him, courts and cops were political instruments. Yulia Tymoshenko, runner-up to Yanukovich in the 2010 presidential election, later was jailed in a case widely criticised as political. The post-Yanukovich government acknowledged as much this July, in a report it prepared with the International Monetary Fund. “The tax administration, the police, the Prosecutor General’s Office, the State Enforcement Service, and the judiciary were noted as having traditionally been viewed as among the most corrupt public institutions,” the report found. The past shows signs of repeating itself. The two prosecutors and a government minister who have led the Maidan shooting probes all played roles in supporting the uprising. One of these officials told Reuters that the investigators gathering the evidence are completely independent. Another gap in the prosecution: To date, no one has been apprehended in the shooting of policemen. According to Ukraine’s Ministry of Interior Affairs, between Feb. 18 and 20, 189 police officers suffered gunshot wounds. Thirteen died. In addition, the former acting general prosecutor who oversaw the arrests of the three Berkut officers declared on television that they “have already been shown to be guilty.” That statement, said legal experts, could prejudice the cases. Ukraine is a party to the European Convention on Human Rights, which states that criminal defendants are presumed innocent until proven guilty. “A public statement by a prosecutor that directly challenges that presumption is a denial of due process,” said Richard Harvey, a British barrister who specialises in international criminal law. Even some of the bereaved families question the fairness of the proceedings. Serhiy Bondarchuk, a physics teacher, died of a gunshot wound to the back on the morning of Feb. 20. His son, Volodymyr Bondarchuk, said the killing is one of the 39 in which Sadovnyk and his two colleagues are suspected. Volodymyr said that based on his own inquiries, he doubts the three were responsible for his father’s death. February 20 was the bloodiest day of the Maidan uprising. Scores of protesters and police officers were shot and killed. A day later, opposition leaders signed a European Union-mediated peace pact. On April 3, Ukrainian authorities announced the arrests of several members of an elite special unit within the Berkut. One was Sadovnyk, the unit’s commander. A father of three, he first joined the Berkut in 1996 after serving in the Ukrainian army. He later won numerous commendations for his police service. Also detained were two younger officers: Serhiy Zinchenko, 23, and Pavel Abroskin, 24. An internal prosecution document, reviewed by Reuters, sketches out investigators’ version of events. It is a “Notice of Suspicion” for Zinchenko, dated April 3. The document alleges that on Feb. 18, the Berkut’s top commander, Serhiy Kusiuk, gave an oral order to Sadovnyk to deliver automatic rifles to his unit. Kusiuk is among the Berkut officers who fled to Russia, prosecutors say. He couldn’t be reached for comment. On the morning of Feb. 20, several members of Sadovnyk’s unit were shot. At around 9 a.m., the document alleges, Sadovnyk ordered his men to fire in the direction of unarmed protesters walking up Instytutska Street in downtown Kiev. The shooting lasted nearly two hours, and more than nine protesters were killed, the document states. Sadovnyk’s order to shoot was an abuse of power, “given that there was no immediate threat to the lives of the police officers,” the document alleges. Vilkov, Sadovnyk’s lawyer, disputes that account. Although the document indicates Sadovnyk was at the scene, Vilkov said his client was not on Instytutska Street when the protesters were killed the morning of Feb. 20. Vilkov declined to discuss Sadovnyk’s whereabouts. In a telephone interview on Sept. 30, Sadovnyk told Reuters he was at a meeting on the morning of Feb. 20 at Kiev police headquarters. It began sometime between 8 a.m. and 8:30 a.m., he said. The purpose, he said, was to deal with reports that many armed protesters would be arriving in Kiev after a call by protest leaders to mobilise. Sadovnyk said about seven police officials and officers were present, and he named three of them. Reuters was unable to locate the three for comment. At the meeting, Sadovnyk said, the attendees heard gunshots and screams over police radios. The radios carried reports of the death of a Berkut officer and of other police wounded on Instytutska Street. Sadovnyk said at that point, he left and drove to the scene, taking about 15 minutes to get there. He said he does not remember what time he arrived, but that investigators could figure it out by tracking his mobile phone. He said he brought a gun and protective equipment. When he arrived, he said, he found a nearly empty scene, with police officers running and the sound of ricocheting bullets. He said he neither received nor gave any order for his unit’s members to shoot at protesters, nor did he fire at anyone himself. Vadim Ostanin, an attorney for the Berkut’s Kiev branch, gave a similar account to Reuters. He said there is a video showing that Sadovnyk attended the meeting at police headquarters. Ostanin said that when Sadovnyk arrived at the scene of the shooting, his unit’s men already were retreating. Oleh Makhnitsky was Ukraine’s acting general prosecutor until June. In an interview, Reuters asked him about the purported photograph of a two-handed Sadovnyk, which was cited at a hearing in April. The purpose of that hearing, Makhnitsky said, was not to judge the reliability of the evidence but to determine whether Sadovnyk was a flight risk. He said the evidence against Sadovnyk would be presented at a future trial. Makhnitsky, now an adviser to President Petro Poroshenko, said he was a leader of a lawyers’ group that provided legal assistance to anti-Yanukovich protesters during the Maidan demonstrations. He said politics played no role in the prosecution of the three Berkut officers. “The investigators are in a separate unit that can’t even be influenced by the prosecutor,” he said. Asked about those comments by Reuters, Makhnitsky said he meant that “enough evidence was gathered to prove they are guilty.” A court ultimately will decide, he said. The extent of the prosecution’s evidence against the three officers remains unclear. Court filings in the cases are not public. As Mark Ames points out, one of the details missing from this article is the fact that Oleg Makhnitsky, the acting Attorney General until he resigned in June, wasn’t just a Maiden leader. He’s a member of Svoboda.